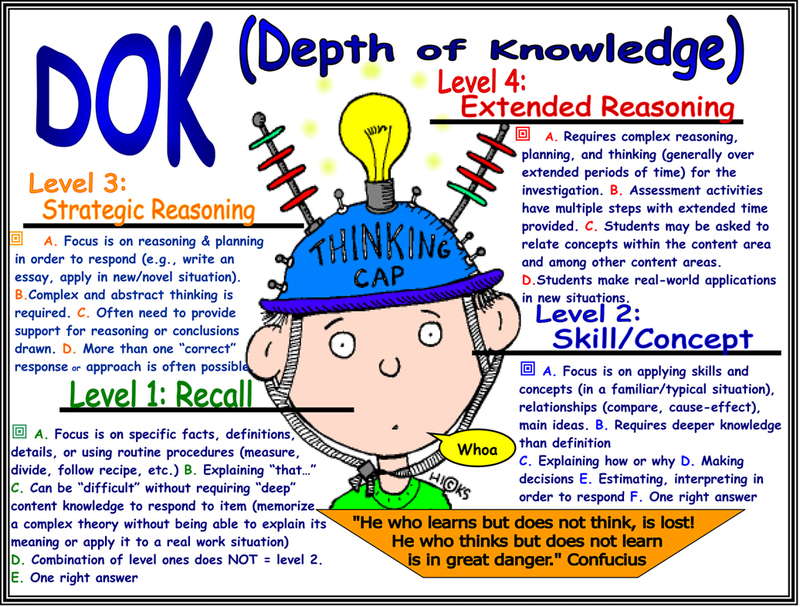 This poster explains Common Core depth of knowledge; doesn’t that kid look like he’s being electrocuted? Common Core has changed public education in recent years as teachers revised practices to help students achieve greater “depth of knowledge.” But those who created a deeply flawed testing system to measure the program’s success failed to live up to its own standards. “Recall” is the first level of Common Core depth of knowledge, calling for students to memorize facts. Recall, then, that the No Child Left Behind Act of 2001 mandated annual testing at public schools. California first used the Standardized Testing and Reporting (STAR) exams. As Common Core standards phased in, STAR ended and the Smarter Balanced Assessment Consortium (SBAC) tests began in California and 17 other states this year. One concept obvious to teachers who proctored STAR exams is countless students made minimal effort or even purposely flunked because they received no reward nor consequence for their efforts. It took little skill to predict the same thing would happen with SBAC tests. In fact, the new computerized exams revile students even more than STAR did. Instead of filling bubbles, students are tasked with writing paragraphs and essays. It’s hard enough to make them do that when they’re getting grades. Some “finished” the ten-hour test in mere minutes, just as long as it took to type “idk” (short for “I don’t know”) in all the boxes. 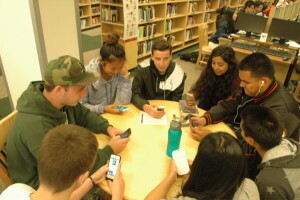 Your tax dollars at work: these students played with their phones in the library instead of testing. Can you blame them? Photo by Laniah Lewis. Consider the evidence concerning SBAC. More than 200 students refused to take the test at the high school where I teach; most spent that time playing with their cell phones in the library. Thousands more across the country opted out of corporate-produced tests that they felt they did not need, and they’re not the only ones to conclude this massive effort wastes an absurd amount of time and money. Parent groups formed to oppose to the exams. California districts sued the state to compensate them for more than $1 billion in SBAC expenses, like computers. Across the country, Connecticut’s legislature responded to public outcry by voting to end the test for eleventh graders. If kids can do that, can’t adults? Lawmakers who created this situation ought to live up to the standards they created by solving this problem. Congress is considering an Every Child Achieves Act to extend testing with some concessions to states’ prerogatives. At the risk of doing their homework for them, I have a few suggestions. If we must have testing, motivate the students! Give the top scorers certificates and bonus points on public university admission applications. That would provide a strong incentive for no cost. 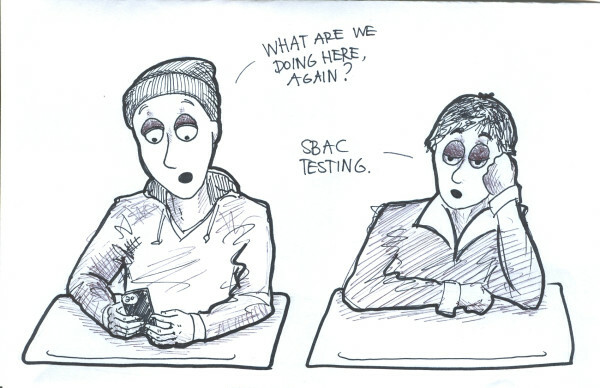 Or replace SBAC and similar exams with tests the kids actually care about, like the California High School Exit Exam. Many kids pay $100 or more to take the SAT; let the state pay that and use scores for both college admissions and government data needs. Compared to the endless expenses of Chromebooks and staff time needed for SBAC, taxpayers would probably save money. The billions spent in the name of standardized testing (not to mention implementing Common Core) are beyond calculation for this social studies teacher, but saving money is only one of many reasons to get the SBAC off our backs. Ask my student Anna Nguyen, who gets straight As and took six Advanced Placement tests this spring. How many of the 12 million students who just endured the exams agree? Those behind SBAC testing ought to know. That’s just a level one question, but you’ve got to start somewhere.